BT has again been recognised as a leading supplier of cloud services by the analysts of Experton Group in their new “Cloud Vendor Benchmark 2015” report. BT was rated as “Cloud Leader Germany” in five categories. BT gained top positions especially in categories focused on enterprise-grade cloud solutions. Aspects such as resilience, global availability and data protection play a pivotal role in this segment. BT was ranked “at the cutting edge” in the key Infrastructure-as-a-Service (IaaS) categories “IaaS – (Hybrid) Managed Enterprise” and “IaaS - Managed Private”. In the “IaaS – Self Service Public” category, BT further improved the attractiveness of its portfolio compared to the previous year. BT also substantially improved its position in the “Cloud Transformation” category, which encompasses consulting and integration services. This reflects the consulting and professional services capabilities of more than 1,200 highly skilled BT Advise Compute experts. Furthermore, BT was able to secure a top position in the newly created “Communications-as-a-Service” category. BT offers comprehensive, cloud-based Unified Communications & Collaboration (UCC) solutions and has successfully established two new offers in the market: BT One Cloud Lync and BT One Cloud Cisco. With its broad portfolio, BT helps global companies fully realise the opportunities of the cloud. BT’s recently announced “Cloud of Clouds” vision supports CIOs in orchestrating cloud resources wherever they are hosted: from their own private cloud installations and globally available BT Cloud Compute services to cloud applications offered by third-party providers (1). 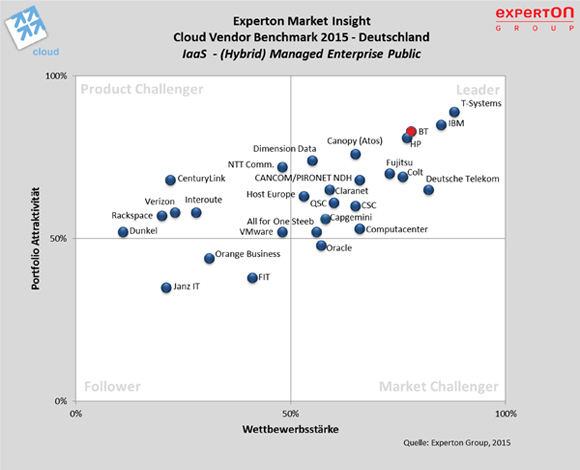 The “Cloud Vendor Benchmark 2015” report is a comprehensive study published by the Experton Group AG pertaining to products and services of leading cloud computing providers in Germany. It rates and ranks the leading providers in a transparent process to help IT decision-makers in evaluating and selecting the solutions best tailored to their needs. In Experton’s opinion, the suppliers recognised as “leaders” offer a comprehensive portfolio of attractive products and services and hold a strong competitive position in the market. Furthermore, they offer their customers long-term stability by incorporating the cloud in business strategy and product development. “Communication as a Service (CaaS) ”.